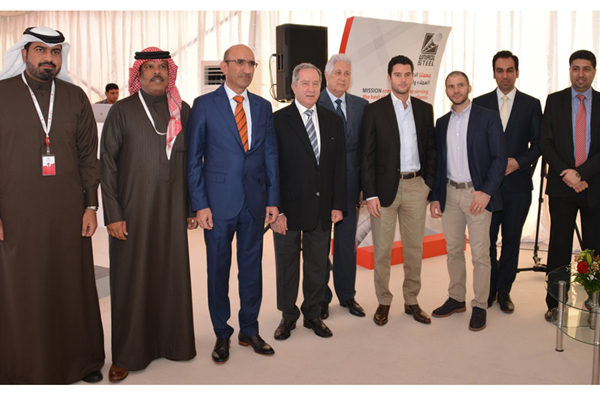 Universal Rolling (Unirol), Bahrain’s leading producer of high-quality reinforcement steel bars, has officially opened its newly upgraded and fully automated manufacturing facility in Bahrain. On behalf of the Minister of Industry, Trade and Tourism Zayed bin Rashid Al Zayani, undersecretary of the Ministry of Industry, Trade and Tourism for Industry Affairs Osama Mohammed Al Arrayedh opened the new plant in Salman Industrial City in the presence of Maher Abu Ghazaleh, chairman/CEO, Unirol; Ali Der, operations director, Unirol, and other executives. “I’m delighted to celebrate the new upgrade of the existing facility in addition to the effort made into transforming it into an efficient, environment-friendly and automated state-of-the-art facility,” said Al Arrayedh. “Unirol’s new investment in the facility and subsequent increased capacity of the furnace as well as new burners, will reinforce its position as the largest steel reinforced manufacturer in Bahrain,” he added. One of the largest steel plants in the kingdom, Unirol has invested $30 million in upgrading the existing facility and transforming it into a new state-of-the art automated mill using the latest technology. With the upgrade, Unirol has increased its production capacity from 175,000 tonnes per annum to 275,000 tonnes per annum and now seeks to be the first production of high-quality reinforcing steel rods serving the Bahraini market. The company has begun to source its raw materials locally and is now launching officially labelled `Made in Bahrain’ steel bars, said Maher Abu Ghazaleh, chairman/CEO, Unirol. “With a total investment of over $30 million till date, Unirol became a leader for rebar supply in Bahrain market and a stronger player in GCC countries. Our focus on quality and customer satisfaction is the key to the success of our organization,” Abu Ghazaleh added. With the increased capacity, the company now plans to reduce the dependency on imports of steel bars and thereby contribute to the economic and infrastructure development in the kingdom. From procuring its raw material from Bahrain-based Sulb Steel to manufacturing the end product, Unirol’s focus will be on the Bahrain market. "The project is the first of its kind in the Kingdom of Bahrain, and its presence is absolutely necessary to bridge the gap in demand levels in the construction supply chain of local rebar production, significantly reduce dependence on imports,” Al Arrayedh said. “Up to now, we have procured our raw materials from GCC but after the upgrade, we now have the possibility of procuring raw materials from a local manufacturer in Bahrain namely our neighbour Sulb Steel,” Abu Ghazaleh said. “Our products are now officially labelled ‘Made in Bahrain’ from raw materials to the end product and this is exactly why we need the support of the different ministries to protect us against dumping from neighbouring countries as well as giving priority to Bahraini steel manufacturing sector for all the public sector projects in conformity with the other GCC countries,” he said. According to Abu Ghazaleh, the presence of ‘Made in Bahrain’ high-quality products reduces the need for imported materials and creates a big contribution to the local economy. “Until we started the production, Bahrain was importing around 250,000 tonnes of rebars annually with a value of approximately $150 million. With the increased capacity, Unirol is offering to keep this $150 million within Bahrain economy,” he said. “With our 40 years of experience in steel trading, we decided to invest in steel manufacturing field three years ago. We put our trust in the stable economy and potential future of Bahrain among the GCC countries,” he said. “World economies are mostly driven by manufacturing sectors which create jobs. Construction is the main indicator of the health of the economy in any developing market and steel production is the prerequisite for the construction sector. “With that in mind, we decided to invest in Bahrain because of its robust economy and a flourishing construction sector,” he added. According to Abu Ghazaleh, the company has invested in the latest technology used in steel manufacturing, which is not only environment-friendly but also leads to energy savings and emission reduction. “In our furnace, we have used `flameless burners’ which is the latest technology in steel manufacturing. Flameless technology provides significantly lower nitrogen oxide, emissions and better thermal uniformity,” he explained. “We have also adopted a fully automated system in our furnace to make the best oxygen natural gas mixture for the highest efficiency enabling us to consume less energy. Harmful nitrogen oxide has been decreased by 70 per cent with this technology,” he added. The company has fully renewed the automation system in its production line to maximise its efficiency and minimise the risk for its safety of its workers, he said. “I am proud to say that our factory is working with zero accident record for the last two years,” he said.